Vietnam – Russia Tropical Center improves research capabilities and quality to fulfill all missions. In recent years, Vietnam – Russia Tropical Center has always focused on its objectives, actively carried out cooperation activities, improved its research capabilities and quality, and applied and transferred many new technologies. Therefore, the center has managed to achieve a lot of encouraging results in conducting military and national defense tasks, in participating in the country’s socio-economic development, and greatly contributed to the traditional friendship relations and the comprehensive strategic partnership between Vietnam and Russian Federation. Vietnam – Russia Tropical Center (a.k.a Vietnam – Russia Combined Tropical Science and Technology Research Center, or VRCT) is a bilateral science and technology cooperation institution. The center was founded and has been operating under Vietnam – Russia (formerly the Soviet Union) Transgovernment Treaty. It is operating in three main fields: tropical durability, tropical ecology and tropical biomedicine, and conducting technology transfer are considered to be its primary political task. After 30 years of development, VRCT has overcome many difficulties and hardships to fulfill all assigned tasks, becoming a multi-sector tropical science and technology center. It has hosted and participated in hundreds of research projects and programs; many of them were major initiatives of the Government and Ministry of National Defense. The results achieved from the center’s activities benefited both Vietnam and Russia Federation, greatly contributed to the two countries’ scientific advancement in general and military scientific development in particular. 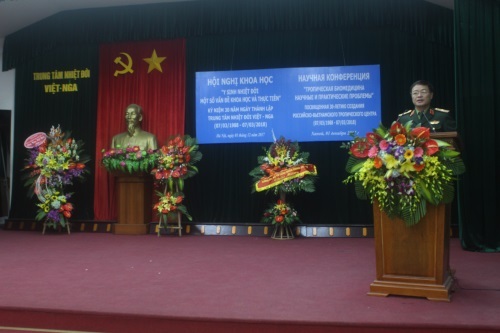 In recent years, VRCT has enjoyed many advantages from Vietnam – Russia comprehensive strategic partnership and the attention of the two countries’ senior officials, of Vietnam’s Ministry of National Defense and Russian Academy of Sciences; however, it also faces a lot of challenges due to limitations in operational mechanism, human resource, infrastructure, etc. To that end, the center has conducted many breakthrough approaches to improve its research capabilities and quality and managed to achieve comprehensive results. As an international cooperation multi-sector, multi-function research institute, VRCT places heavy emphasis on building a high quality staff, focusing on scientist teams and leading experts in different fields of study. Due to the lack of high quality personnel, the Center’s Party Committee issued Resolution 93-NQ/DU, dated January 27, 2011 on “Abroad training for cadres by 2020 and beyond”; Resolution 260-NQ/DU, dated March 28, 2012, on “Personnel leadership in the 2011-2015 period”, and many other personnel regulations. Accordingly, the center has combined human resource building, training and development with proper personnel posting; applied appropriate recruitment policies to attract more skilled employees (especially those who were trained in Russia), etc. As a result, the current working staff of VRCT is sufficient in quantity, well-suited structure, and highly skilled. In the center, 98.5% of the staff has bachelor degree and above; in which 58% has postgraduate degree. In addition to personnel solutions, VRCT has also spent major investments in infrastructure and research equipment. Since 2007, it has been closely working with related offices from the Ministry of National Defense, mobilizing resources for 14 equipment procurement projects for 19 laboratories and testing workshops. Among them, there are several national and international standard facilities such as: Dioxin Analysis Laboratory, Biological Technology Testing Laboratory, General Experimental Workshop, etc. Besides, the center implemented reforms in research and technology transfer management mechanisms, strengthened the overall management of the Director Board while granted more independence and responsibilities for its subordinate institutes and project leaders; renovated project selection methods and processes; and conducted evaluation for research projects base on their final products. At the same time, VRCT instructed its subordinate units to propose research objectives base on their needs and actual conditions; increasingly implemented research quality inspection and evaluation at all levels; actively organized and participated in domestic and international science conferences, meeting and workshops, etc. With highly determined spirit, appropriate approaches, and support from both Vietnamese and Russian government, in recent years, VRTC has made a lot of sustainable and comprehensive improvements. For example, the center’s ability of researching, applying and transferring technology has been significantly enhanced; its science and technology operations have been strengthened both in quality and quantity. Since 2010, VRCT has implemented 110 research projects in many fields of study such as: tropical durability, tropical ecology and tropical biomedicine; including 23 Vietnam-Russia joint projects; 07 State-level projects; 21 Ministry of National Defense projects; 03 other ministerial level projects and 56 junior-level projects. Based on the center’s research outcomes, many science and technology products have been developed and effectively applied in military and national defense activities, as well as in the country’s socio-economic development. Notably, the center has conducted many researches to evaluate the durability and reliability of Russian military hardware in tropical condition to propose appropriate employment and maintenance methods. It also implemented research on anticorrosion technology to apply in preservation of weapons and ordnance; and synthesized specialized chemicals and materials for weapon and ordnance production. Besides, VRCT studied on electrochemistry technology to employ in naval vessel and marine construction maintenance; developed underwater sea acorn removal device for military vessels; tropicalized KACTA-2E2 radar system; and introduced a new evaluation chart for Lava propellant inspection device, etc. Most notably, the center worked with the Department of Fuel Supply under the General Department of Military Logistics, Dung Quat Oil Refinery Factory and Russian partners in a joint project to manufacture JET-A1K fuel and L-62 diesel oil to replace imported Russian fuel which was mainly being used in Vietnam military aircraft and naval vessels. Also, the center has transferred many technologies for the military, such as dieselization for Zil-131 engine; Sukhoi aircraft technical condition management system; upgraded aiming system for AK-76 naval gun; and engine testing frame for AL-31F engine. In term of tropical ecology, VRCT effectively conducted researches on Vietnam’s ecosystem and biodiversity, providing a lot of invaluable data for the country’s biological resource studies; experimented on using some types of animals and plants for economic and military purposes; monitored and analyzed dioxin contamination level and proposed solutions; participated in dioxin decontamination projects in Danang, Bien Hoa, etc. Also, the center proactively implemented researches on climate change, assisted in 05 projects on this issue initiated by the Ministry of National Defense and has achieved several encouraging initial results. In the field of tropical biomedicine, VRCT focused on dioxin’s impacts on human health; developed and introduced testing measures, preventive treatments and recovery methods for those who were exposed to dioxin. Besides, the center cooperated with Russian counterparts to further study on military medicine for specialized arms, conduct researches on tropical infectious diseases, such as plague or viral hemorrhagic fever, and extract biological active substances to produce medicine. And last but not least, VRTC successfully acquired, transferred and applied high pressure oxygen treatment in medicine practice in Vietnam. In the coming years, the center will have a lot of demanding objectives, while facing numerous challenges. Fortunately, it will also gain many benefits from the ever developing Vietnam – Russia comprehensive strategic partnership. Besides, reforms in the field of science and technology from the Russian side, as well as its adjustments in operational and organizational management and investment mechanism for VRTC will also provide a lot of advantages for the center. That said, VRTC will continue to comprehensively strengthen its capabilities to elevate itself to become a regional and international-level research center, capable of implementing key science programs for the Government and Ministry of National Defense, being a prestigious institute for conducting Vietnam-Russia joint scientific initiatives. To achieve these goals, the center will keep enhancing the leadership of its Party Committee and management board in research activities; further reform its structural organization; focus on developing high quality human resource; and breakthroughs in science and technology research planning. At the same time, VRCT will also further participate in joint research projects, and invest and modernize its infrastructure and equipment to fulfill all short-term and long-term tasks. In scientific research, the center will continue to work with its Russian partners to develop projects which ensure benefits for both countries; closely combine basic research with applied research, technology adaptation with technology transfer, prioritize military and national defense tasks; integrate its operations into the overall technical work of the military; and further attract and expand the contribution of the Russian side in technology transfer for Vietnam. In short term, VRCT will push ahead the implementation of Scientific Research and Application Program 2015-2020; focusing on introducing joint research projects in new fields of study. VRCT’s determination, its intellectual capabilities, as well as its history of 30 years of development and operation will surely be the foundation for the center to firmly step forward to fulfill its missions, deserve to the connection point of scientific research and technology application and transfer between Vietnam and the Russian Federation, greatly contribute to the cause of building and safeguarding the Motherland.